It's summer movie season, the time when blockbuster films come out every week and we pit Vin Diesel against Wolverine. But how do you keep that cineplex excitement alive when you're at home on the couch? With books! Here are 10 science fiction novels that pack more non-stop thrills than Fast & Furious 6. Really. Top image: The Reality Dysfunction by Peter F. Hamilton. This one is sort of a gimme, considering our review of this book proclaimed it to be " as close as you'll get to a Hollywood blockbuster in book form." We praised the space-faring setting as well as the "intense space station combat," among other things. And you guys agreed. Says Jacqueline, "Leviathan Wakes is a serious guilty pleasure. Part gumshoe detective story, part buddy adventure, part romance, part space opera, with the added bonus of vomit zombies. Rip roaring adventure." In general, a few people mentioned Bujold's Miles Vorkosigan series, full of space adventure and intrigue, as a good movie-substitute. But this book, in particular, seemed to be singled out as especially fizzy. Or maybe Young Miles. As we wrote a few years ago, "The three-time Hugo-winning saga of the disabled Miles Vorkosigan and his awesome military career is like Flash Gordon on steroids." Don&apos;t Remake These 21 Movies, Film These Books Instead! We tend to praise Banks' sprawling Culture series for its thought-provoking portrayals of a post-scarcity society and artificial intelligences. But he can also bring intense, fast-paced thriller-y action — people also praised Banks' first Culture novel, Consider Phlebas, for that. In this one, a Culture operative named Cheradenine Zakalwe is brought out of retirement for One Last Mission, while flashbacks travel backwards in time, retracing his career and showing just how everything went wrong for him. Cracking great suspense and action, alongside Banks' usual mind-expanding ideas. This is a quick, fun read in comparison to some of Willis' longer, more in-depth works — and it's basically a frontier story set on another planet, with Willis poking fun at tons of genre tropes. It's the story of two "famous planetary surveyors," Carson and Finriddy, who travel to a distant planet and wind up going on an expedition into unknown areas with a native guide and a woman who only knows of them through ridiculous video dramatizations of their exploits. Basically your standard "buddy cop romance in a steampunk post-apocalyptic world with zombies" kind of story, in which Detective Inspector Mina Wentworth is forced to team up with the notorious Iron Duke to travel into the zombie-infested wasteland and save England. Says Carrie: "Iron Duke has the most action, but Riveted has a much better hero and still has plenty of action to go around. Steampunky goodness." Art by Anastasia Tychkova. The tale of Gully Foyle, the resolute individualist, who faces off against massive megacorps that seek to control everything. Says Kenneth James, "Every chapter is a classic, near-standalone action set-piece. (And his first novel, The Demolished Man, is not too far behind; in that book every chapter is a classic crime-thriller-future-noir confrontation.)" Says Alface, this book "starts off slow and keeps on changing gears and doesn't let go to the end." This is just one of the many, many dystopian young adult science fiction novels that have trundled down the assembly line in the years since Hunger Games unleashed an insatiable hunger. But it's becoming a movie soon, and people are enthralled by this frenetic depiction of a future Chicago where everybody has to choose to embody one singular virtue. Reviews of this book tend to mention its nonstop violence and Roth's mastery of action scenes. 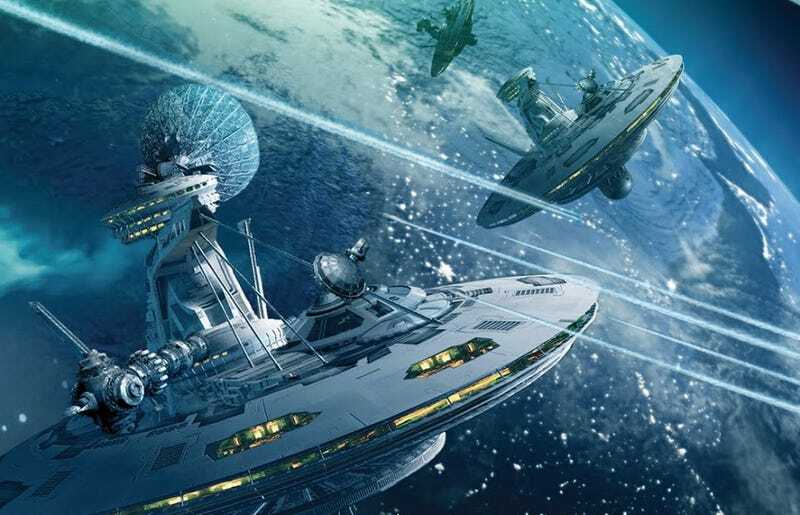 Says Rick Cromack: "Genetically bred starships swallowing in and out of sentient orbital cities; boosted mercenaries capable of harnessing more firepower than a main battle tank; exotic, interdimensional beings that by their very existence shred the fabric of reality; planetary defense platforms capable of mazing entire arcologies; energy weapons that render entire regions of space into dead zones; planet-busting antimatter bombs deployed to annihilate the populations of entire worlds. And, then, there are the armies of returned dead, possessing both the living and godlike abilities." As we wrote in our review a few years ago, this debut novel is popping with clever ideas, as if Morgan wasn't sure he'd ever get to write another one. And we added back then: "It could make a terrific movie, if they could travel back in time to 1990 and get Bullet In The Head-era John Woo to direct."